The winter storm will dump snowfall totals of 10 to 20 inches in parts of the Northeast before moving out of the region later in the day Sunday. In the wake of the storm, temperatures in the Northeast will drop nearly 40 degrees as an arctic blast settles over the eastern U.S.
President Donald Trump on Sunday urged Americans "to be careful and try staying in your house." "Large parts of the Country are suffering from tremendous amounts of snow and near record setting cold," he tweeted. "Amazing how big this system is." The president, who has at times denied climate change, added, "Wouldn’t be bad to have a little of that good old fashioned Global Warming right now!" Heavy snow is showing on the radar Sunday morning from Ohio to Maine with the heaviest bands over much of New York state. Snowfall rates there are estimated to be at 1 to 2 inches per hour. A mix of rain, sleet, freezing rain and snow is currently falling across parts of the Lower Hudson Valley into much of Connecticut and southern Massachusetts. 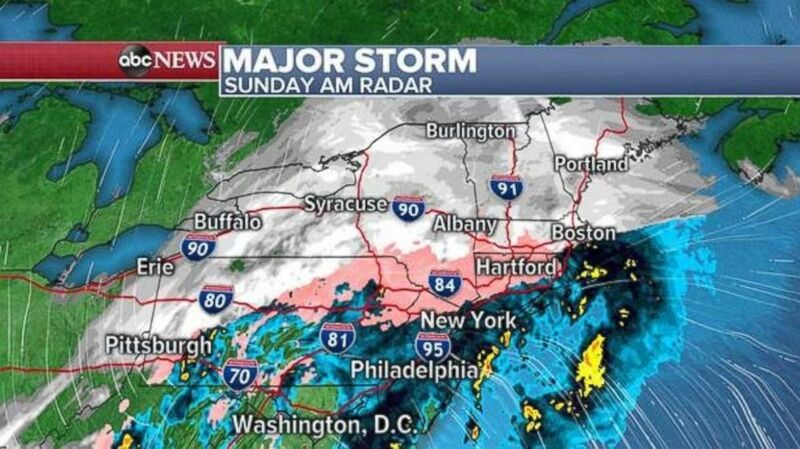 A mix of snow, ice and rain will continue throughout the day on Sunday in the Northeast. Very heavy rain is falling farther south in New York City and Philadelphia. New flood alerts are being issued for parts of the New York and Philadelphia metro areas, due to the possibility of 1 to 2 inches of rain. Additionally, coastal flooding is a concern through the day from New Jersey to Massachusetts. Strong winds are likely from the Tennessee Valley all the way to Florida on Sunday. Behind the storm is the very cold air that is already moving into the Midwest and is on the way to the Northeast, where new wind chill alerts have been issued for many major Northeast cities. Additional snowfall on Sunday is expected to be confined mainly to the interior Northeast, with over 12 more inches of snow still to come in parts of New York, Vermont, Maine and New Hampshire. Locally, over a quarter of an inch of ice is also possible across parts of the Lower Hudson Valley, Connecticut and Massachusetts. Snow totals in the interior Northeast should top out at approximately 10 to 20 inches. 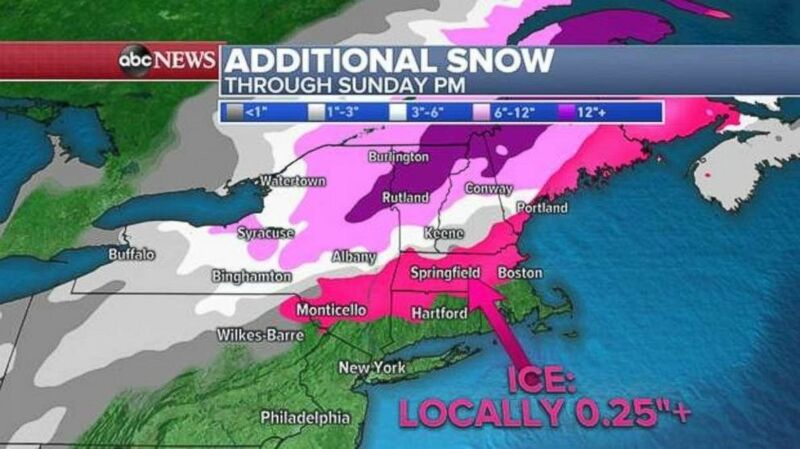 Northern New England could still see over a foot of snow through the day Sunday. The storm is pulling in a lot of mild air to Washington, D.C., Philadelphia and New York, which is keeping the snow and mixed precipitation north and west of these cities. However, the danger is not over yet. As the storm slides east, it will begin to drag the very cold air behind it. The clash of colder and milder air will increase winds significantly as the day goes on. Washington, D.C., Philadelphia and New York all are seeing temperatures in the 40s and even 50s on Sunday morning. However, by early afternoon, temperatures will come crashing down. 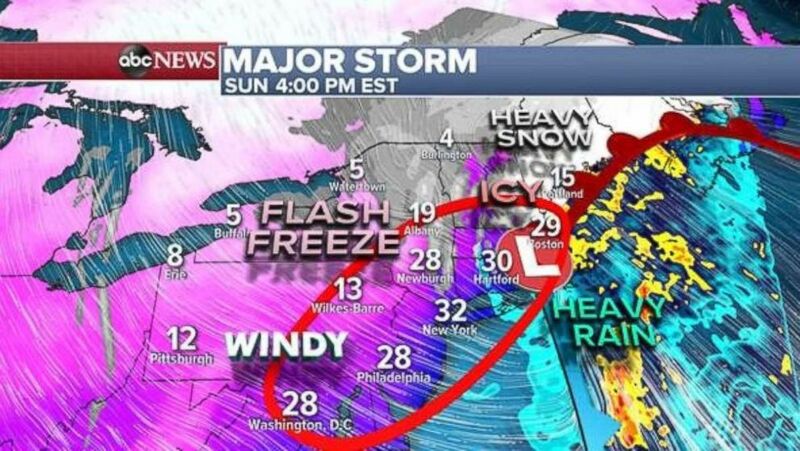 A flash freeze will move in behind the storm during the day on Sunday. By Sunday night, the actual air temperature will crash into the single digits and teens across the Interstate 95 corridor. In interior parts of the Northeast, temperatures will go below zero with a fresh snow pack. After starting Sunday in the 40s and 50s from Washington to New York, temperatures will have dropped 40 to nearly 50 degrees by Sunday night. Everything that has fallen, from snow to sleet to rain, will freeze over. This could make traveling dangerous Sunday night and Monday morning. This situation, called a flash freeze, can make it harder to treat some road surfaces. 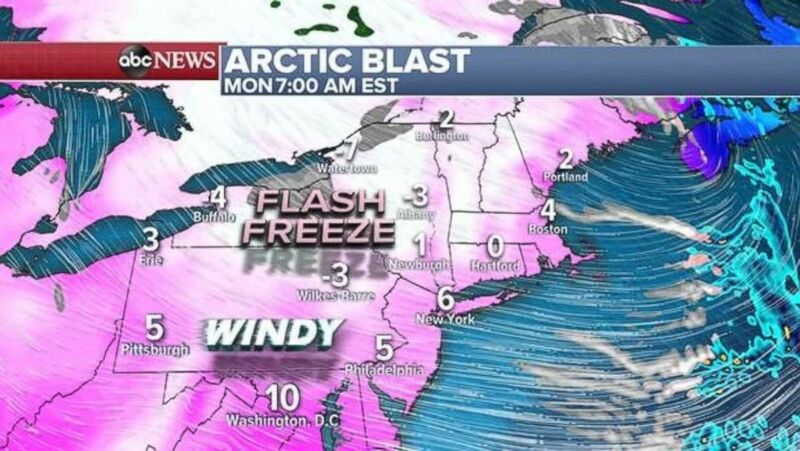 Temperatures will be in the single digits across most of the Northeast on Monday morning. 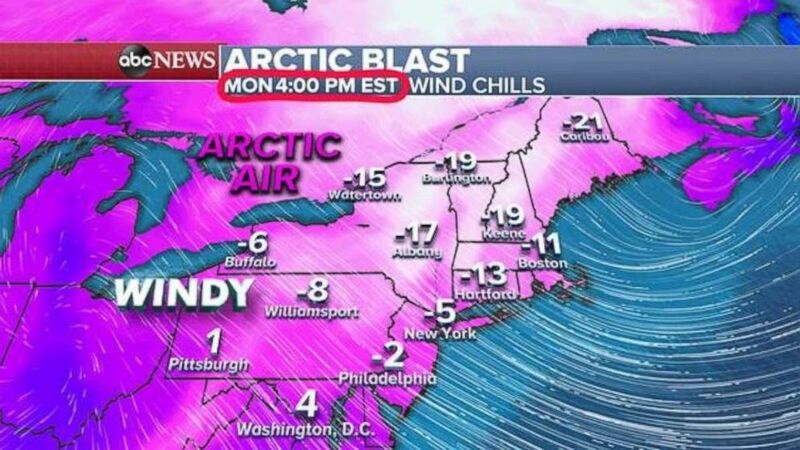 The Northeast is not alone in dealing with brutal cold. The central U.S. is seeing wind chills in the teens all the way down to the Mississippi Valley on Sunday. Gusty winds and very low temperatures will cause wind chills of minus 10 to minus 20 across the Northeast, including Philadelphia, New York and Boston. The wind chills on Monday morning will be dangerously low, well below zero, across the whole Northeast. Even during the day on Monday wind chills will not rise above zero for much of the Northeast. It will be downright brutal nearly the entire day. 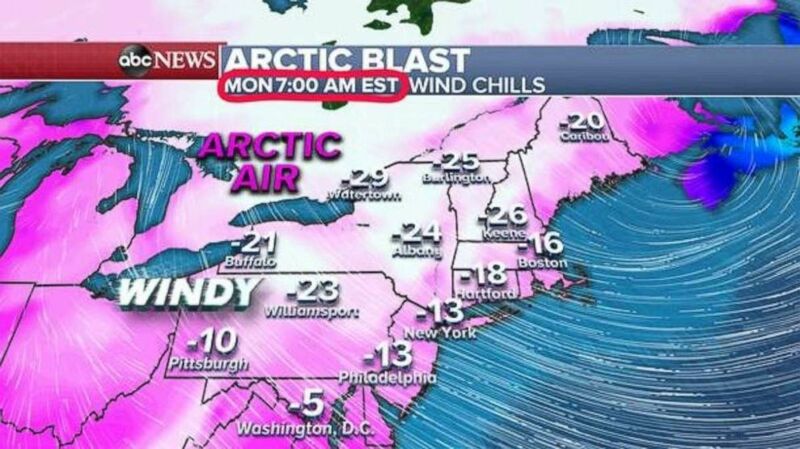 Wind chills during the day Monday will remain below zero in much of New York and New England.